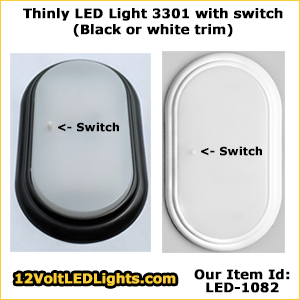 RV LED Dome Light - plastic surface mount light fixture with rocker switch. This interior LED ceiling light offers a bright replacement fixture for your RV lights or boat lights. LED wedge bulb has light output comparable to a 60 watt incandescent bulb. Dimmable with our EF1206 12 Volt LED Dimmer. Applications: RV, marine, recreational vehicle lighting, cargo trailers, military vehicles, buses, step vans and trucks.